Are you confused about what kind of Low Profile Truck Toolbox you should get for your pickup truck? Well, worry no more – we got you. This guide will look into the benefits of having a Low Profile Toolbox, and we will also discuss three of the best Low profile toolboxes on the market. The reason why low profile toolbox designs are preferred to standard toolbox designs is that low-profile designs allow for greater visibility from the cab than standard truck toolboxes. 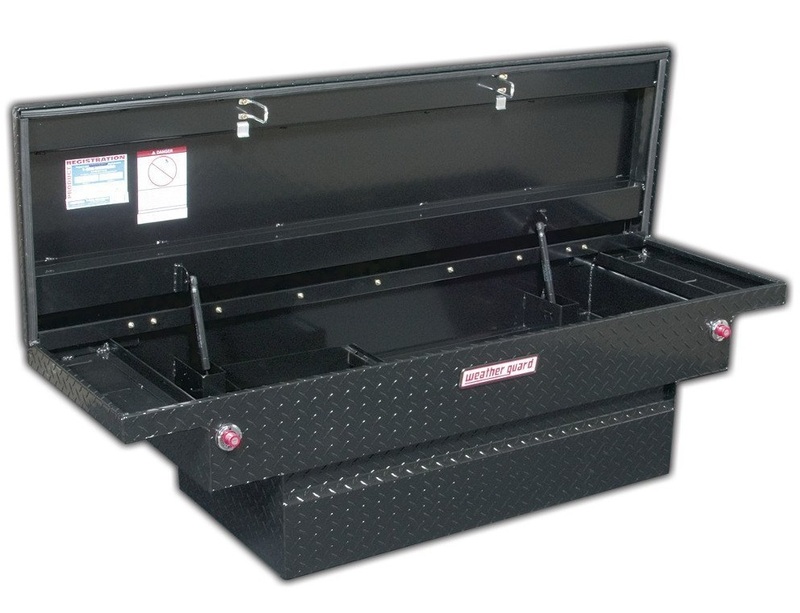 A low profile truck tool box can offer robust security for your tools and equipment. They provide ample storage space and protection from harsh weather. 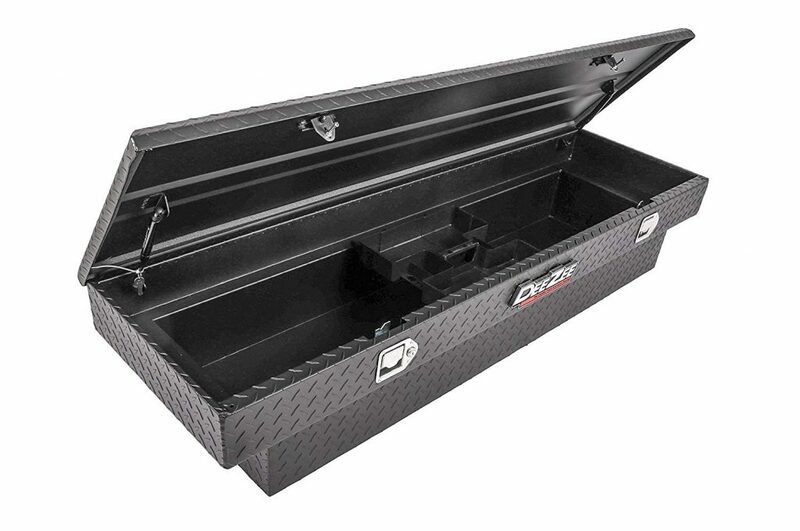 A good low profile truck toolbox is durable, and allows for easy access to its contents. Here, we will look into the features, pros, and cons of our top three picks. We are confident that you will be able to make a better decision once you are done reviewing these top options. 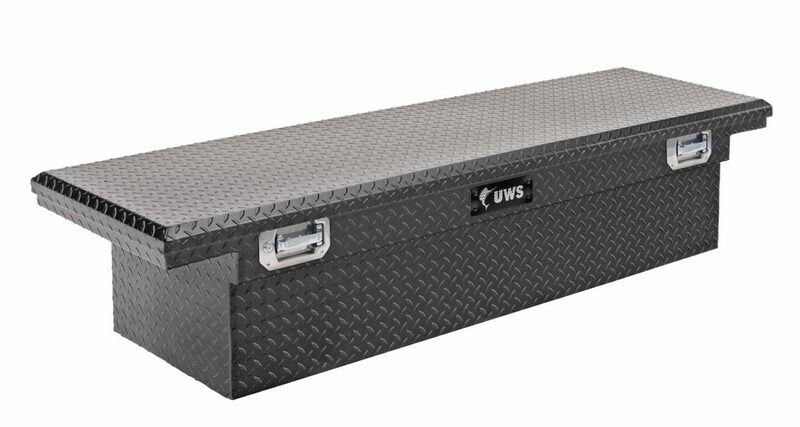 This is a high-quality toolbox made of extra-thick aluminum for durability and security. Its self-closing struts automatically close the lid to secure your tools and equipment. This one-piece tub and lid toolbox provides ample space for storing your valuable items. You can rest easy once you enclose your tools in this box because it is virtually impossible to break into. It weighs about 65 pounds. It does not matter where you and your truck roam; this toolbox will keep your tools organized, accessible and fully secure. This tried-and-tested crossover toolbox has its interior sealed off from the elements ensuring that your precious tools will not be damaged. The aluminum has high resistance to corrosion making the toolbox durable. The lid features the RigidCore foam-filled design that enhances its structural integrity making it hard to bend or warp. The lid also opens and closes smoothly. With the lid opening to a full 90 degrees, you will be able to access your tools and equipment rather easily. The self-opening struts allow for easy opening when your hands are engaged. This is a low profile toolbox with the lid built lower than a standard lid which allows for a better view from the cab. A MicroSeal gasket seals off the inside of the toolbox from outside elements such as moisture, dust, and insects. It has built-in screwdriver holders and a three-compartment sliding tool tray. It is easy to install. This toolbox is available in a range of sizes allowing you a choice depending on your preferences. It is a highly dependable toolbox. Some users have pointed out that the toolbox is too heavy, almost unnecessarily heavy. You get the sense that it would have been made lighter while still maintaining reasonable levels of strength and security. We think that the manufacturer was not ready to compromise on any of the good qualities that this toolbox offers. Constructed of heavy duty Brite-Tread aluminum with a low profile design. This single lid crossover toolbox has a low profile design and is made of heavy-duty aluminum. It has an attractive matte black finish and a textured black powder coat that prevents oxidation thereby protecting your tools and equipment from damage. This toolbox features a crown style lid that has a full pan double-V stiffener that provides robust security. It has lockable paddle handles made of stainless steel, and also features a closed cell foam gasket. This provides protection from outside elements that can damage the contents. Its dampened gas shocks and self-adjusting strikers make this toolbox one of the most sort-after in the market. The toolbox comes with a removable plastic tray that you can use to keep your small items well organized. This toolbox does, however, have some disadvantages. Firstly, the toolbox does not have premade slots for J clamps making installation a bit complicated. One has to make the clamps so as to install this toolbox, which can be much of a hassle. Secondly, users have pointed out that the removable tray is quite small, and that the toolbox does not have compartments. A bigger tray would have come in handy, although some of the users say that this is not such a big issue for them. The most important thing is that the toolbox provides ample storage space, and is very secure. This toolbox has a tamper-resistant retracting lock that provides robust protection against theft. The cover opens at the full 90 degrees for easy access to your tools and equipment. It comes with mounting brackets that make for easy, drill-free installation. This toolbox has a body channel for extra strength. It is compact, yet it provides ample storage space. The saddle box is installed on the rails of your pickup truck, which allows for plenty of room underneath. They are made of weather-resistant aluminum and steel for strength, safety, and durability. However, some of the buyers point out that the Weather Guard logo is too conspicuous. Besides that, they are delighted with pretty much everything else. We do understand that buying the best low profile toolbox for your truck is as important a task as they get. This is a personal project for you. We know you obviously don’t want to see some toolbox that you don’t like, on your truck, every morning! That is why we have created this guideline – to help you make a sound decision. Your personal preferences will also influence your decision. It is essential that you define exactly what you want to achieve so that you can know what to look for in a toolbox. The Weather Guard Saddle Box is our preferred truck storage option because it is easy to install, extremely secure and is very durable. The Weather Guard Aluminum and Powder Coat finish ensure years of dependability. You get to access the contents easily. Its full weather seal protects against corrosion and damage. It is a high-quality toolbox. It fits all full-size pickups with 8 ft beds. It also has an impressive appearance, and it looks really good on a truck.